Beautiful house benefitting from a pool, spacious terrace with a panoramic sea and village view plus caretaker, garage and parking for 2 cars. For sale by Savills Saint Jean Cap Ferrat. 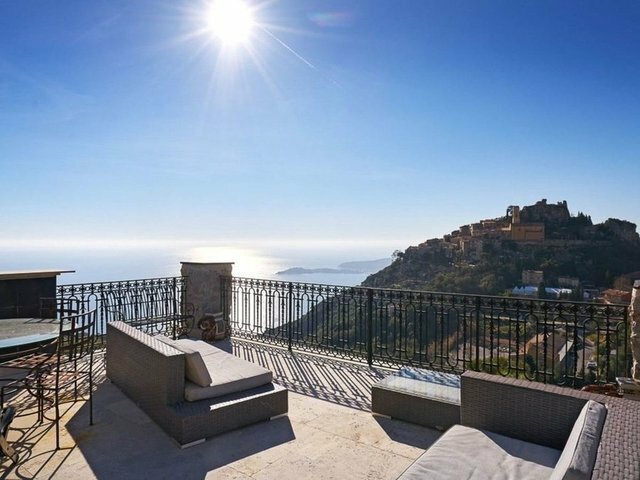 Ideally situated for the historic village of Eze and ameneties, this beautiful house of approximately 232 sq m features amazing views over the sea and village. Ground floor: 1 bedroom, cellar, laundry room, charming veranda with sea view, fitted kitchen, Hammam, dining room, shower room, living room, guest toilet. Lower level: 2 bedrooms, storage space, bathroom. This house benefits from 2 private parking spaces, a garage, swimming pool, jacuzzi and caretaker. Agency fees at the charge of the vendor. Fee table available online at savills.fr and on request. Situated between Nice and Monaco, Eze is a popular picturesque hill top village which boasts panoramic views and stunning scenery. The location of Eze is divided into three "ledges", the Haute Corniche is suspended between the sea and sky, the medieval village of Eze itself sits a little lower and finally the resort town of Eze-Sur-Mer sits on the coastline. Property in this region ranges from spacious villas, private domains, generous apartment complexes and medieval village houses. Nice is approximately 12km and Monaco is approximately 8.5km.